It’s time for a confession. With all of the restaurants we have visited and covered, there are still some cuisines that we have overlooked. A friend clued us in on a Thai restaurant that we have passed more times than we can count. The description of the food was so compelling, that we knew it would require some firsthand investigation. 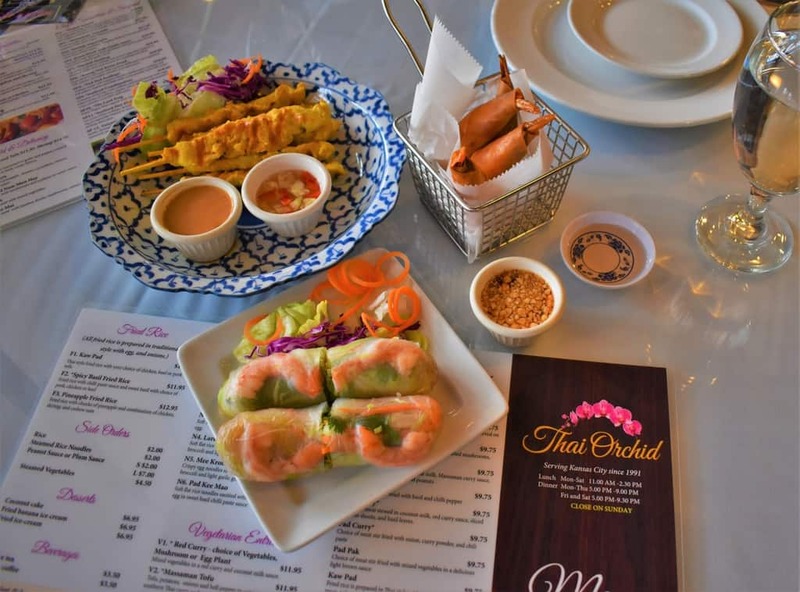 We made our way to 6504 Martway to find out how Thai Orchid brings the flavor. We want to thank Thai Orchid for their hospitality. Rest assured that all opinions are our own. The restaurant sits on the side of a strip mall, so it is kind of tucked out of sight. At least, that’s the excuse we are using for not recognizing it sooner. Once parked, we made our way inside. The interior exudes a relaxed charm. Muffled conversations sprang from nearby tables, but there was not the normal din of noise that can be found at many urban eateries. The table-clothed tables added a nice touch, which elevated the experience to a refined feel. To get a true gauge for how Thai Orchid brings the flavor, we knew it would require sampling a variety of dishes. 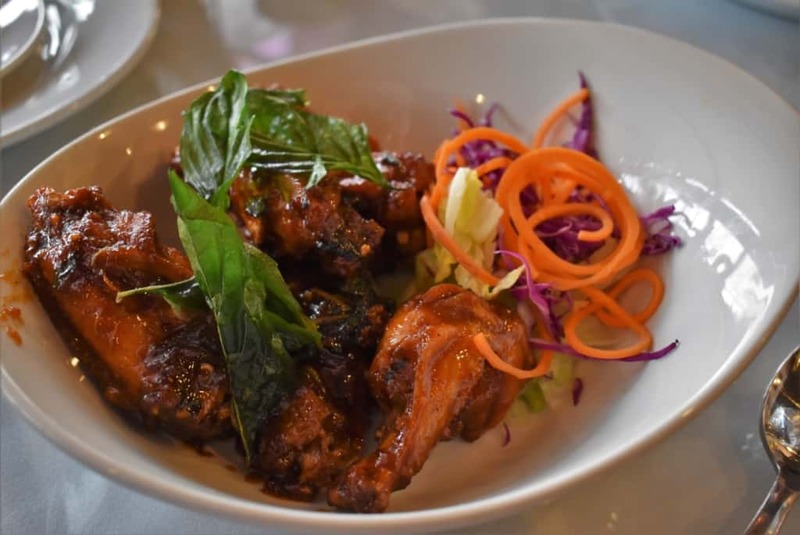 A relative newcomer to the menu are the Spicy Basil Wings. While Crystal is not a wings fan, I absolutely devour them. This version had a deep combination of flavors that added a slight sweet aftertaste to counter the spicy. The flavor was so well proportioned that I had to remember to pace myself for the constant flow of dishes to arrive. I have a confession. When I chose the subtitle for this paragraph, I felt pretty pleased with my pun. I suppose it’s the “Dad Joke” in me slipping out. The next batch of eats arrived in a flurry. The Chicken Sate was grilled just right, and the peanut sauce was the perfect compliment. Like a good magician, we made these disappear. 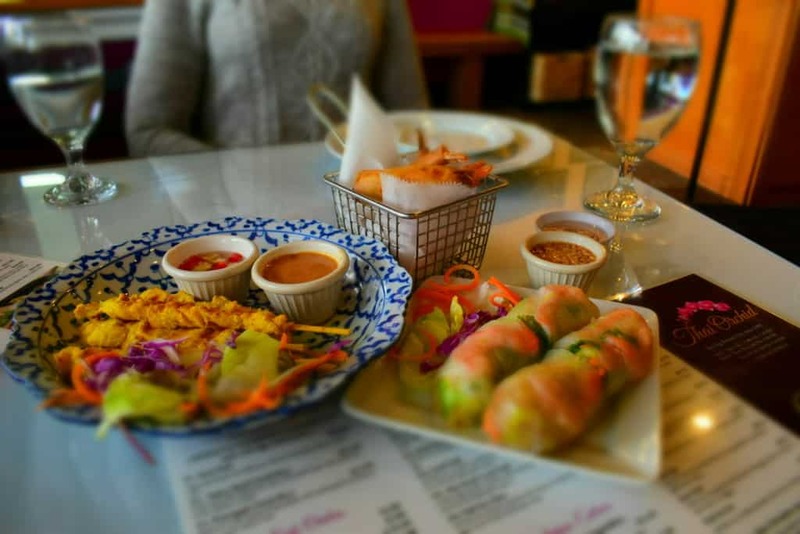 A pair of Soft Spring Rolls added plenty of color to our table. The delicate flavors were enhanced by the sweet and spicy dipping sauce that is served with this dish. An unexpected delight was the Koong Kraborg. A combination of proteins include a whole shrimp. Wrapped in rice paper and deep fried, this appetizer is amazing when dipped in the plum sauce that accompanies it. It was quickly apparent that we would be stuffed by the time the main courses arrived. Before we could finish our appetizers, the main courses found their way to our table. Actually, we were being served by Johnny that evening. He was so helpful in walking us through the menu and explaining the available heat levels of dishes. Yes, you can customize how spicy you prefer a dish to be, which was a welcome relief for us lightweights. With Johnny’s assistance, we selected two dishes for our main course. 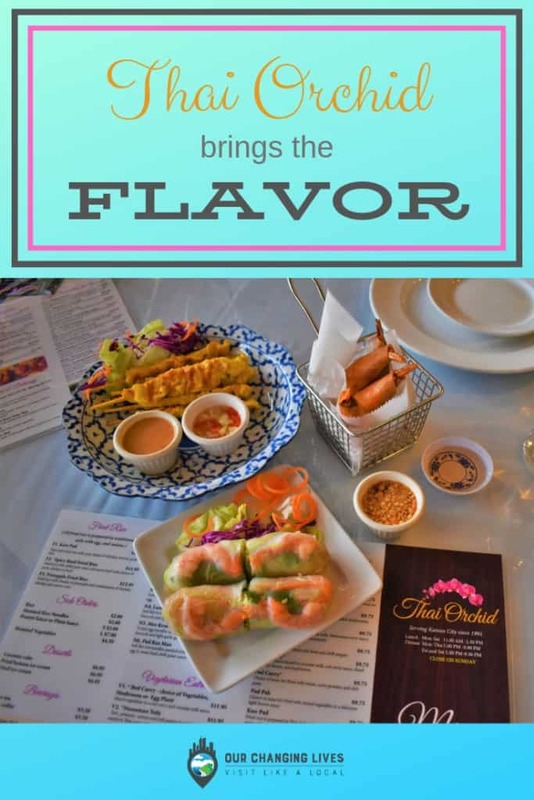 These use completely different bases, so we were truly getting to see how Thai Orchid brings the flavor to their dishes. Pad Bai Gra Prao comes with choice of chicken, beef, shrimp or squid as the protein base. The chicken we chose was accented with red and green peppers, which added some nice color to the dish. A chili pepper base is used for the sauce, and can be adjusted for the diner’s comfort. Ladle some of this over the white rice and you end up with a delightful mouth full of spicy flavors. On a side note, the leftovers make for a wonderfully aromatic lunch at work. For our second main course, we chose another one of the newer dishes at Thai Orchid, since we were newbies to the place as well. The Yellow Curry has an almost soup like texture, but brings flavors we had not sampled previously. 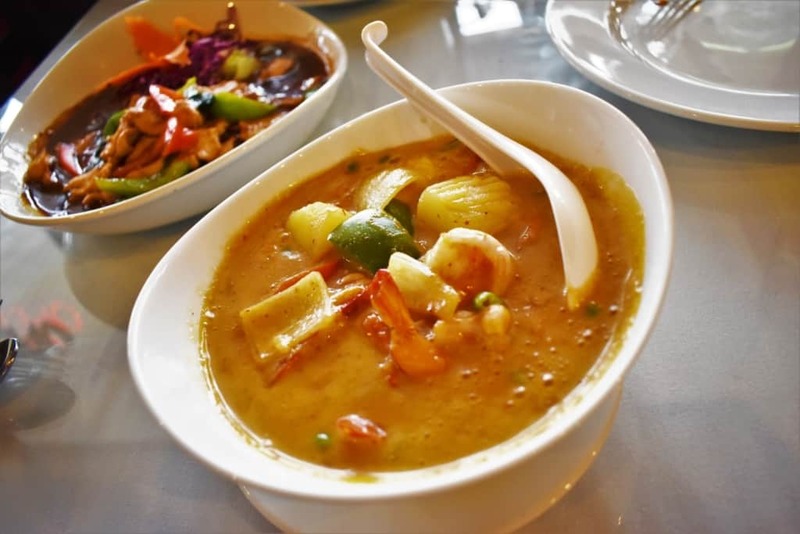 With five variations of Thai Curries on the menu, this is obviously a huge part of this cuisine. We learned that the various colors are achieved through the use of specific spice bases. The yellow variation sometimes uses turmeric to bring out the base color. Our dish had a slightly sweet flavor that was derived from coconut milk. The filling was a combination of shrimp, onion, peppers, and potatoes. The vegetables are cut into chunks, so they don’t get lost in the sauce. Besides the wings, which are too messy for Crystal, we both enjoyed every dish. This foray into the world of Thai cuisine was a delightful experience. It reminded us that no matter how many restaurants we have sampled, there are still plenty to explore. With Thai Orchid bringing us new flavors, we now know that we have to keep scanning the horizon for opportunities. Can you remember your first visit to a restaurant that introduced you to a completely new cuisine? We’d love to hear about it and the impact it had on your restaurant selections after that. Drop us a note in the comments section below, so that everyone can learn from your experience. Thanks! i was introduced to Thai cuisine by a friend in the early 1970s. It was on Broadway in KCMO around the 3500 or 3600 block, as I recall. It was described by the friend as being similar to Chinese which I already loved. I ate at the House of Toy about once a week during that time and had been introduced to Chinese by my father at King Joy Lo over twenty years before that. That Thai restaurant began my foray into various cuisine which continues to this day. For the past eleven years, I have led the International Dining group at my church to a different international restaurant each month. 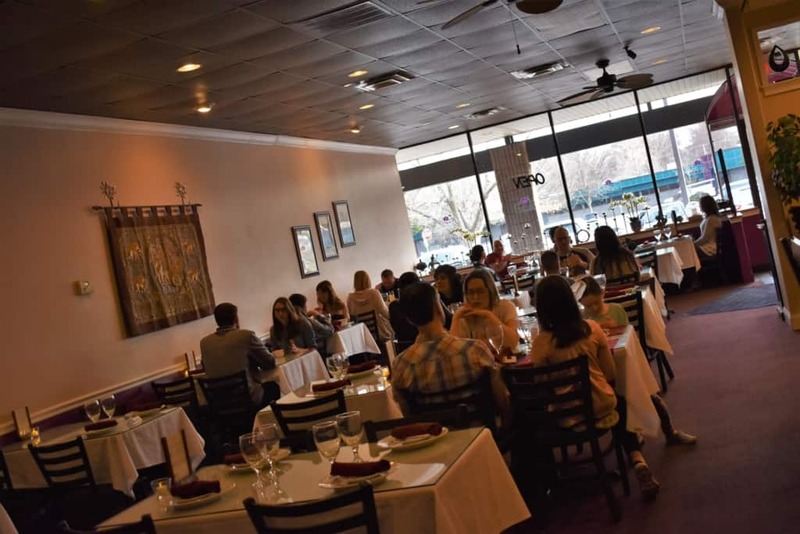 We have sampled Afghan, Nepalese, Ugandan, Persian, Yemeni, Portuguese, and other more familiar cuisines – all because of that wonderful Thai experience over forty years ago. What a great story of experiencing new flavors. It’s good to hear that you are leading others to the discovery of different cuisines. Thanks for sharing! 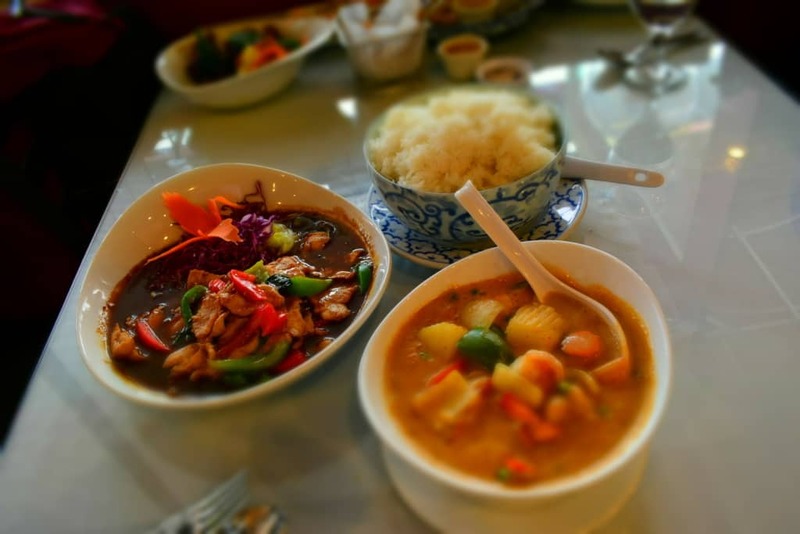 We recently discovered Thai food, too, and will have to try Thai Orchid. Our favorite is Sweet Siam in Westport (it was in Lenexa when we discovered it.) 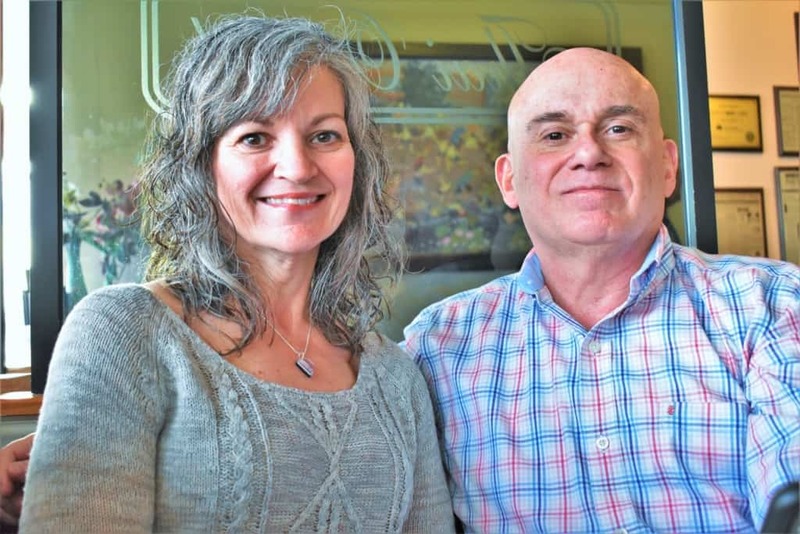 Their coconut soup is out of this world as is their coconut cake. We’ve tried several main dishes including the pad thai and curry and have thought each one was really good. The coconut soup is spicy, but they might be able to tone it down. Pula, thanks for clueing us in on another Thai option here in KC proper. Will have to add it to our list. So glad you enjoyed the article and photos.